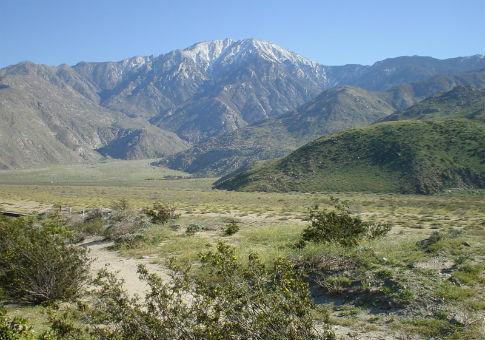 The San Jacinto Mountains in Riverside County, Calif.
California officials will decide on Wednesday whether to approve plans for a politically connected green energy company’s controversial solar project over the objections of environmental groups, Native American tribes, and the county that will be home to the project. The California Energy Commission (CEC) will vote on Wednesday afternoon on a proposal to extend a crucial construction deadline for the Palen solar project in Riverside County, Calif. The project has languished in the planning stages for five years and drawn intense opposition from groups that generally support the expansion of solar power. The history of the project is long and complex, providing a window into the troubles that have plagued the U.S. solar industry during the Obama presidency and exposing the hoops that green energy-friendly bureaucrats have jumped through to accommodate that industry. Four companies have owned stakes in the Palen project since it first sought CEC approval in December 2010. All four have received taxpayer support through the U.S. Department of Energy. The initial applicant, Solar Millennium AG, is now bankrupt. The project’s tumultuous history makes it difficult to accurately assess Palen’s environmental impact, its critics say. They accuse its current owner, the Spanish renewable energy company Abengoa, of mismanaging the regulatory process and attempting to rush CEC approval in order to prevent a full regulatory vetting of the project. Abengoa has received extensive taxpayer backing for its various U.S. renewable energy projects. Former employees, who accuse the company of flouting state and federal environmental and workplace safety laws, say it has relied heavily on its political connections to secure that backing. In addition to its CEC review, changes in the proposed Palen design may also require additional federal environmental reviews. However, the Bureau of Land Management, which must sign off on federally sited energy projects, says Abengoa has not even notified the agency of changes in Palen’s planned design. "We are pending a formal notice from the company on what their plans are," said BLM spokeswoman Martha Maciel. "Once we receive that, we will determine what is necessary." The project has gone through a number of ownership changes since Solar Millennium initially applied for BLM and CEC approval in 2010. That company went bankrupt in December 2011. Oakland-based BrightSource Energy acquired Palen the following June. BrightSource then formed a joint venture with another firm, Caithness Energy. Following approval of the project by the CEC, BrightSource and Caithness told the CEC in December 2012 they would be amending the proposed project, scrapping the previously approved solar trough technology in favor of solar tower technology. That set off a new round of regulatory scrutiny: CEC had to examine the environmental impact of the new design. A month after applying for the amendment to its permit, BrightSource acquired Caithness’ ownership stake. As CEC examined the amended project design, Abengoa signed on. It partnered with BrightSource and, in November 2014, bought that company’s stake and became Palen’s sole owner. By August 2015, it was clear that Abengoa was not going to be able to begin construction on the project by the CEC’s December 15 deadline. It asked the commission to extend that deadline by a year. "Due to the bankruptcy of a prior owner and the efforts of the subsequent owners to amend the project to better address concerns identified by the Commission’s staff and other stakeholders, the Project was unable to proceed along the original construction timeline," the company told the CEC. Abengoa said it had been diligent in pursuing regulatory approval for the project, blaming factors outside of its control for preventing timely commencement of construction. Opponents of the project say that is simply untrue. "The current owner of the Project has not been diligent in pursuing construction of the Project or in securing the required land use and environmental document approvals from the Bureau of Land Management. Nor have any of the former owners been diligent," Riverside County recently told the CEC. Numerous stakeholders also objected to the solar tower design planned by BrightSource and pursued by Abengoa. Environmental groups including the Center for Biological Diversity, the Sierra Club, and Defenders of Wildlife said the solar tower design would imperil local bird populations, among other environmental concerns. Riverside County and the Colorado River Indians Tribes also cited environmental concerns in announcing their opposition to extending Abengoa’s construction deadline. Abengoa announced on August 27 that in response to these concerns it would abandon the solar tower plan and revert to a solar trough technology similar to the one originally proposed by Solar Millennium and approved by the CEC. The commission’s prior approval would allow it to rely on previous environmental reviews rather than conducting a new assessment based on the revised design crafted by BrightSource and Abengoa. The company asked that its request for a deadline extension be approved on the condition "that the amended project description include solar trough generating technology similar to that previously approved for the Palen Solar Power Project." However, Abengoa and BrightSource spent months insisting to commissioners that solar trough technology such as that originally envisioned for the Palen project would be totally infeasible. Despite asking that CEC apply its previous approval to the revived trough-based design, Abengoa and its partners previously acknowledged that reverting to that design would require extensive environmental review that could delay the project. "If solar trough or PV were feasible, they would be at least five, six, seven, eight years out because we are essentially starting over," a BrightSource executive told the CEC in July 2014. "It’s always been our position that the solar trough, as originally licensed, was not a feasible alternative for us." Asked if Abengoa could repurpose trough technology used at its Solana solar plant for use at Palen, a company executive told the CEC, said no. "The time to re-permit things" would make doing so prohibitive and prevent the project from beginning construction by CEC’s deadline, he said. In response to Abengoa’s sudden change in Palen’s design, Riverside County warned that approving an extension of that deadline would prevent an adequate environmental review of the project. "It may not be possible for the Commission to thoroughly evaluate and decide upon the future amendment in an open public process by the end of December 2016 which would lead to another petition for an extension of time or, worse, a rushed review of a project that will have a lasting impact on the residents of Riverside County," the county said. The CEC itself worried about delays if the project reverted to a solar trough design. "Changing the project technology back to a parabolic trough technology could at least cause a project schedule delay, and it is not known at what point a project schedule delay would affect project viability," commission staff wrote in September 2013. Despite potential delays, staff wrote in a response to Abengoa’s design change in August that a new environmental review of the project would be a preferable alternative to attempting to evaluate the changes as an addendum to the existing review of its solar tower design. "The time and resources that would be required by the filing of a new AFC are not insubstantial, but the process of evaluating the proposed changes on the same site would be simpler and easier for all participants to understand and monitor with a new administrative record unencumbered by past activities, actions and documents," CEC staff wrote. They also agreed with the County and other commenters that Abengoa had not handled the approval process effectively. "The statements from the project owner in the Petition demonstrate that there has not been diligence by the project owner to build the certified project," staff wrote. Despite expressing support for a new environmental review, staff bought into Abengoa’s argument. It recommended approving the deadline extension on the condition that the revised Palen design resemble the originally approved solar trough technology, even though Palen’s owners insisted as late as last year that the trough design was not feasible and would in fact require extensive additional environmental review. The County alluded to CEC staff’s apparently contradictory recommendations on how to move forward. "As stated by Commission staff, the process of evaluating the proposed changes on the same site would be simpler and easier for all participants, and concerned parties, to understand and monitor with the filing of a new application for certification and a new administrative record unencumbered by the past actions and documents," the County wrote. The CEC staff’s recommendation that the commission approve the project has not satisfied local stakeholders concerned about the project’s environmental impact. "This proposed modification represents a step backward toward a more destructive project," wrote attorneys representing the Colorado River Indians Tribes in a response to Abengoa’s plans to revert to a solar trough design. "This proposed change amplifies CRIT’s concerns about the project," they said. "CRIT urges the Commission to deny the petition to extend project deadlines and instead require a complete and up-to-date environmental analysis of the proposed solar trough technology." This entry was posted in Issues and tagged California, Green Energy, GreenTech. Bookmark the permalink.